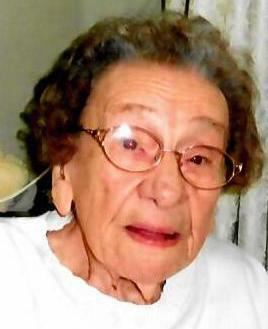 Obituary for Edna Mae (Weaver) Hill | Meek & Dalla Valle Funeral Home, Inc.
Hill, Edna Mae (Weaver), 102, Windber, passed away Aug. 15, 2018 at Richland Healthcare. Born May 30, 1916 in Windber. Daughter of Oliver and Margaret (Burkett) Weaver. Preceded in death by parents, husband William J. Hill, daughter Betty Jean (Hill) Holsopple, siblings Russell, Ruth Webb, W. Earl, Anna McCreary, Lloyd, Alfred, Dean, Ross and Margaret Livingston. Survived by daughter Patricia Morris, son William J. Hill, Jr, grandson Steven Morris, sister Grace Hoffman and sister-in-law Gertrude Weaver all of Windber. 1935 Graduate of Windber Area High School and a member of Berkey Church of the Brethren, where she helped in the nursery and kitchen for many years. Edna worked at W.T. Grant Co. in Windber, the cafeteria at WAHS and volunteered at the New Day Thrift Shop and the Windber Church of the Brethren. The family will receive friends from 5 to 7 pm Sunday at Meek & Dalla Valle Funeral Home Inc., Windber and from 10 until time of service at 11 am Monday at Berkey Church of the Brethren, Windber. Pastors Crissman, officiating. Interment Berkey Cemetery.